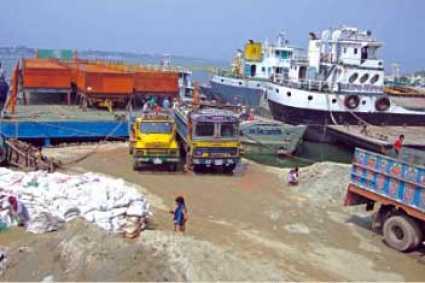 Agartala, May 29 : Bangladesh has agreed to permit India to use its Ashuganj port for transporting foodgrains to the Northeast. Tripura Food and Civil Supplies Minister Mr. Bhanulal Saha said, Bangladesh government previous week allowed India to transport 10,000 tonnes of rice for Tripura which would come from Haldia port to Ashuganj port in Brahmanbaria district in Bangladesh; about 40 kilometer (km) from here, and then the grains would reach Agartala by trucks. Mr. Saha said, the order was passed by the Bangladesh government earlier last week following hectic diplomatic parley and the state government has taken steps to carry the food grains. Dhaka had allowed to transport heavy and over sized machineries for the Palatana gas—based thermal power project through its territory. Palatana thermal power project in Gomati district would begin generation commercially next month.